South African religious leaders have called on the ruling African National Congress to compel President Jacob Zuma to resign following a damning indictment issued by the country's highest court against him. Representatives of the South African Council of Churches and the National Religious Leaders Council made their April 8 call for Zuma to go during a meeting with top officials from the ruling African National Congress. The campaign to force Zuma's resignation is a drama that also involves a family originally from India who immigrated to South Africa in 1993 and was drawn into its politics. They are accused of intefering in the country's governance and of calling the shots in appointments made by Zuma in what was dubbed as "State capture." The Gupta family became a powerful economic force and personal backers of Zuma, but they deny any wrongdoing, saying they are caught up in local political crossfire. 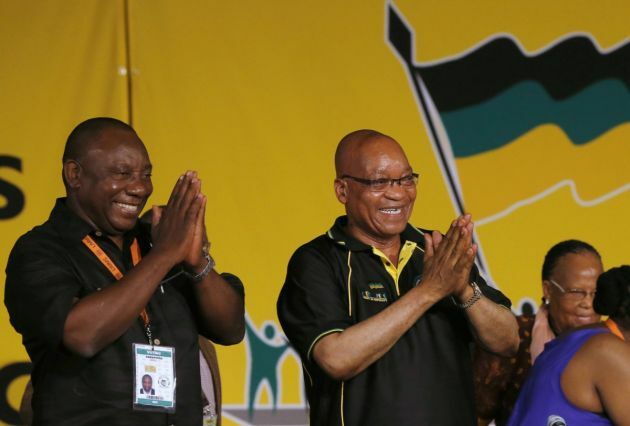 The combined religious leaders are the latest group in a rebellion against the president that is gaining momentum within the ruling African National Congress, in a political crisis that may lead to his ousting. ANC veterans, church and civil-society organizations and business leaders have intensified recent calls for the 73-year-old Zuma to step down. The calls have accelerated since the South African Constitutional Court ruled on March 31 that the president "failed to uphold, defend and respect the constitution." The current predicament for Zuma erupted in December when he fired his finance minister, Nhlanhla Nene, leading to an economic crisis triggering a selloff of the rand currency. The Constitutional Court ruled that he violated the constitution for failing to repay taxpayers' money spent on his private home. Even the ANC is looking into the Guptas, investigating allegations they offered cabinet positions for concessions. The Guptas had on April 8 quit management and board positions in companies they control, saying they faced "a sustained political attack." And then two of the Gupta brothers left South Africa for Dubai on April 7, City Press newspaper reported April 10. South African Council of Churches general secretary, Bishop Malusi Mpumlwana, said the faith-based community could not sit and do nothing when the country was imploding. It had to ask Zuma to think about the implications of his continued stay in the high office. "We requested the ANC leadership to assist Zuma to resign. We also requested a one-on-one meeting with the president. We would like the president to think about his continued stay in the office," Mpumlwana said during a media briefing in Johannesburg. Zuma and the deputy president Cyril Ramaphosa did not attend the meeting so the religious leaders have requested to meet Zuma in the coming week. A number of key South African personalities have called for Zuma to step down before the church leaders made their call. Ahmed Kathrada, 86, who shared prison cells with Nelson Mandela when they were jailed in 1964, said the "crisis of confidence" in the country's government can only be solved by Zuma stepping down. "I know that if I were in the President's shoes, I would step down with immediate effect," Kathrada wrote in an open letter. "I believe that is what would help the country to find its way out of a path that it never imagined it would be on, but one that it must move out of soon." Thabo Makgoba, Desmond Tutu's successor as the Archbishop of Cape Town, had also issued a stinging critique of the state of affairs in South Africa. "We live in a society based on fear. Our members of Parliament are too scared to hold the executive properly to account," he told university students in Johannesburg on March 31. "Those in the executive or in public service who are alleged to have been approached by a well-known family living not too far from here - and who have allegedly been offered blandishments in return for business favours - have been too afraid to speak out about it."